The ceremony was held in the presence of Zayed bin Rashid Alzayani, Minister of Industry, Commerce & Tourism and Minister in Charge of Bahrain Bourse; the Governor of the Central Bank of Bahrain Rasheed AlMaraj; Kamal bin Ahmed, Minister of Transportation and Telecommunications, along with CEOs of the listed companies and officials of Bahrain Bourse. Shaikh Khalifa bin Ebrahim Al Khalifa, chief executive officer of Bahrain Bourse, said: “We are pleased to welcome the listing of APMT, the exclusive manager and operator of Khalifa Bin Salman Port, on Bahrain Bourse. This listing will enrich the diversification of the sectors on Bahrain Bourse and widen the investment opportunities and horizon for investors. “The listing of APMT on Bahrain Bourse marks an important milestone towards achieving our strategic objectives in terms of attracting new issuers from fast growth economic sectors and expanding the Bourse’s investor base. APMT became the first IPO issuer listed on BHB to utilise Bahrain Clear’s newly developed eIPO platform, a sophisticated and efficient solution for online IPO subscription via a dedicated portal, which was able to capture 90 per cent of the subscriptions received, which includes eIPO and bIPO,” he added. According to him, 64 per cent of APM Terminals Bahrain’s workforce is Bahraini who now have the ownership of the company. 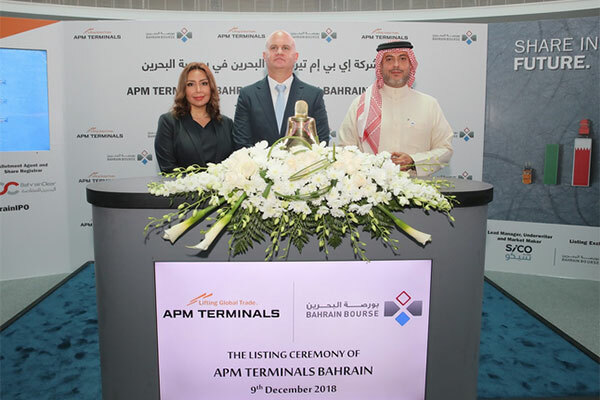 APMT Bahrain will be traded under the trading symbol APMTB in the IPO Market for a duration of six months according to the procedures followed in the market, and will then be transferred to the regular market to be traded under the Services sector. As the exclusive operator of KBSP – the only general commercial port facility in Bahrain -- APMT handles all containerised cargo to and from Bahrain in addition to general cargo. APMT completed in November 2018 an Initial Public Offering (IPO), where 18 million shares were offered at BD0.660 ($1.74) per share representing 20 per cent of the company’s total issued share capital. The IPO was met with strong retail & institutional demand resulting in an oversubscribed offer with funded applications totalling 6.8 X the institutional offer size and 2.2 X the retail offer size.